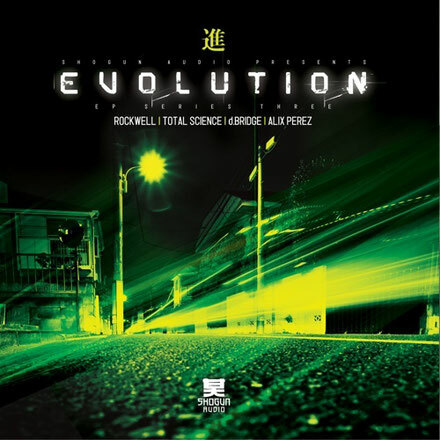 Roughly a year on from the ‘Evo 2’ EP, Shogun Audio deliver the next installment of the Evolution series. Now well and truly an established figure in the D&B hierarchy, Rockwell takes the lead with the dangerous and aptly titled ‘Constantcomplexrhythmicsound’ - this is a journey into full-on techno-infused, 303 angry acid D&B. Veterans and legends of the scene Total Science are up next with the creeping space FX of ‘Feel Me’. Classic vocal samples ooze through the mix of old-skool breaks and morphing mid over some stomach-churning sub frequencies for a proper late night stepper. Shogun favourite D Bridge steps up to deliver a twinkling slice of future soul music. ‘Not What You Want’ is quite the opposite as it soothes and moves you with delicate pads and bluenote drops all in the name of drum & bass music. Jubei takes control of one of the biggest tracks from the debut Alix Perez LP ‘1984’. This take on ‘Myriads’ is defiantly dirty, keeping the original vibe alive as Jubei goes in hard and comes out the other end with a gnarly bassline groove to finish off the EP. The Prototypes’ ‘Subterrestrial VIP’ is also included on the digital EP package only. Out 7th May.